When these are ready, prepare your falafel spice mix. Fry the herbs and spices with around 3 onions properly to get all the flavours out. If you can use freshly ground up spices it will make a big difference to the flavour. . Spoon out your spice and onion mixture and blend until you get a smooth, slightly wet consistency but not too wet so you can mould shapes with a spoon (or use an ice cream scoop!) Add more water from the soaked chickpea liquid as you go along to get the desired consistency. Shallow fry, we worked out around 6 mins at 180 C or until crisp and brown on the outside. Of course be super super careful and never leave oil unattended! Serve and enjoy! 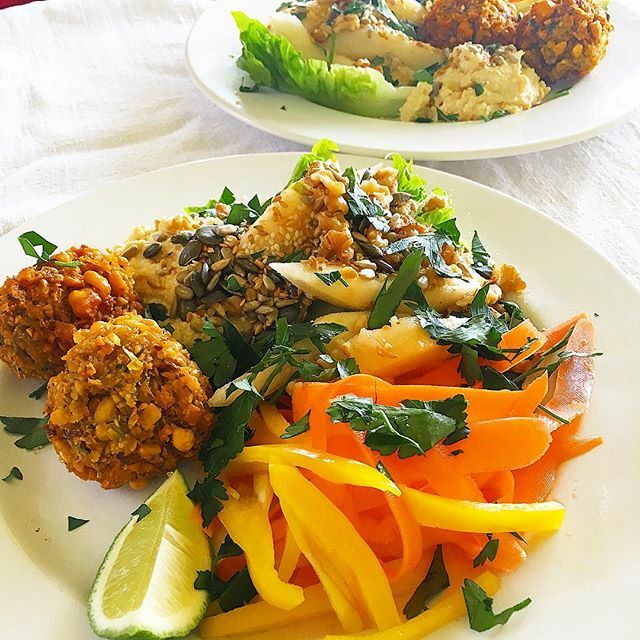 I hope you've enjoyed this post, what's your go-to quick and easy health food? We are as a species, pretty adaptive and sensitive, It's definitely what made us survive evolution despite not being the biggest or the scariest. Its all due to a process we have called Homeostasis which is maintaining a stable environment inside our bodies. Homeostasis is mainly controlled by our nervous system, hormones and a constant dialogue between outside stimuli, and our internal control centre; the hypothalamus. For example, using the control of temperature as an example; we essentially have an internal thermostat which constantly monitors our blood temperature and will adjust our physiology and tell ourselves to shiver, (muscle contraction generates heat) raise our hairs (trapping warm air insulates our body- yes there are benefits of not getting laser hair removal in the winter months!) or change our behavior; reaching for the cashmere jumper or opting for a lovely steamy hot bath. Therefore, we are constantly adaptive, we go up, we go down, we fluctuate and if it were any other way and if we didn't deviate from the mean on an almost minute by minute we wouldn't be such amazing, adaptive fine specimens of evolution. This is why I have been researching a lot about supplements which can support our homeostasis, given that we are under so much stress in our modern lives. Of course we know that the future of medicine is to design tailor made medicine, nutrition and supplements based around our genetic code, but what is there available now to move in synergy with our normal homeostatic fluctuations? The answer could be Adaptogens. The evidence based problem with Adaptogens is there is little clinical data, but a lot of anecdotal and historical use across Traditional Chinese Medicine and Ayurveda. That being said, if we think of the hype of say, compounds in turmeric, ginger and tea which are now being used and recognised in advanced genetic clinical trials as protective against many diseases, it makes sense to consider Adaptogens as a viable and supportive option to supporting our homeostasis, and make us more resilient to stress/ modern life in general. Given how our homeostasis is disrupted due to stress; Adaptogens work to balance deviations but work in sync depending on what your body needs instead of completely blocking a response, they adapt depending on what your body needs - cortisol a little too high? Adaptogens may buffer this effect and help you deviate closer to your normal state. 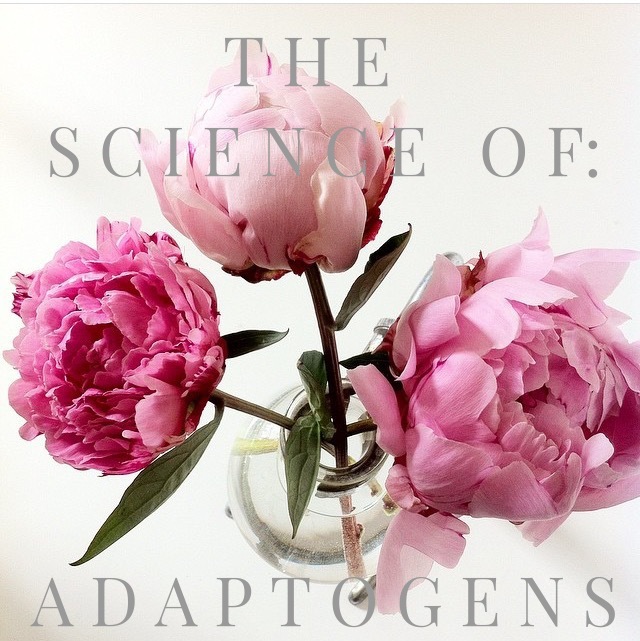 While the cellular mechanisms are not entirely clear, and therapeutic doses yet to be clarified Adaptogens are beginning to see wider recognition with clinician and incorporation into next generation super supplements. Linking our stress levels to how we look may seem like a vain train of thought, but it is actually very interesting how our neuropsychoendocrinology and stress homeostasis can drastically take a toll on our skin health. Adaptogens have been shown to minimise the increase of certain proteins associated with cell destruction. Stress has also been shown to decrease barrier function (dry skin anyone? )and decrease skin immunity potentially giving rise to skin infections, p.acne colonisation etc This is because our skin is an endocrine organ, so will respond to stress in the same way other organs and tissues do: simply, in a detrimental way that will show on your skin. Adaptogens essentially minimise these systemic effects. A little cushion for an already incredible adaptive response. Ashwaghanda has shown to significantly reduce all markers of stress and even reduce cortisol in a standardised clinical trial of 64 people with no adverse effects even with a high dose (300 mg Ahwaghanda for 60 days) Researchers concluded this reinforced the individuals response to stress, essentially providing resilience and enhancing well being and that state of serenity we all strive for! Changes in our endocrine system and homeostasis which perpetuate the development of obesity is gaining a lot of research. If we can pinpoint the changes in our hormones that lead to the snow ball effect of weight gain and obesity, we could help a lot of people who struggle to maintain a healthy weight. Reishi mushrooms have been shown to be a fantastic adaptogen for this area of homeostasis, Reishi has been shown to be a powerful adaptogen agent in preventing fat accumulation and body weight increases and has been shown to have significant beneficial effects on immune function, tumour minimisation and decreasing allergies. I have been a big fan of Fillerina products and is my go to recommendation when friends ask me which hyaluronic acid gel product is best. I was so happy when the gorgeous Molly from Ebwpr gave me the New lip volume product to try. I definitely noticed a difference, there is an instant plumping effect without the painful tingling in other products which use stimulating compounds to increase blood flow to the lips. I often struggle with dry, cracked lips, especially with weather changes such as it being very hot, and since using this, I have had no dry lips what so ever! The applicator is a roller ball and very easy to apply directly on the lips. I love this because hyaluronic acid gel is the master hydrator- there is no better ingredient to hydrate and plump by drawing water in to the tissue. Lip balms can mask the problem by coating the lips and preventing water loss to some extent, but hyaluronic acid is a great carrier molecule, meaning it can penetrate into the skin and work as an active ingredient to improve skin moisture levels. 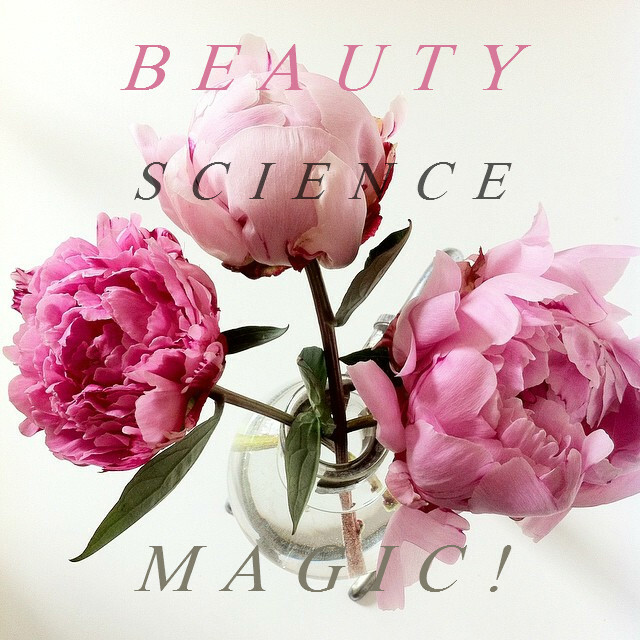 THE SCIENCE BEHIND THE BEAUTY? Hyaluronic acid is an incredibly versatile and useful molecule in beauty and works by increasing hydration and therefore volume, boosting collagen production and as a carrier molecule for other active ingredients. Loss of hyaluronic acid as we age is a key contributor in the decrease of skin volume, plumpness and hydration. In the aesthetic world, hyaluronic acid gel based injectable fillers are the go to ingredient as the body naturally breaks down HA over time and it is low allergy. 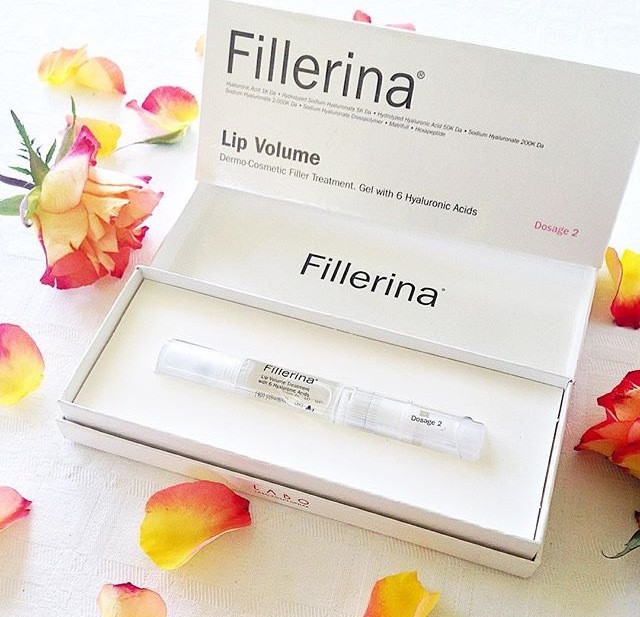 However if you don't like needles, Fillerina topical Lip volume is in my opinion the best topical alternative for boosting lip volume and I use this product religiously day and night. The biophysical properties of HA make it a vital beauty molecule: it is an intrinsically "water loving" molecule and draws water in from its surroundings, which is key to retaining moisture in our skin. I read that hyaluronic acid can hold up to 10,000 times its molecular weight in water. Fillerina works by replenishing hyaluronic acid deep in to the dermis on topical application so the skin draws in more water; replenishing lost volume, increasing hydration without injections. Similarly, an important study has shown hyaluronic acid to increase collagen production; another fantastic way in which HA is intrinsically linked to healthy skin physiology. 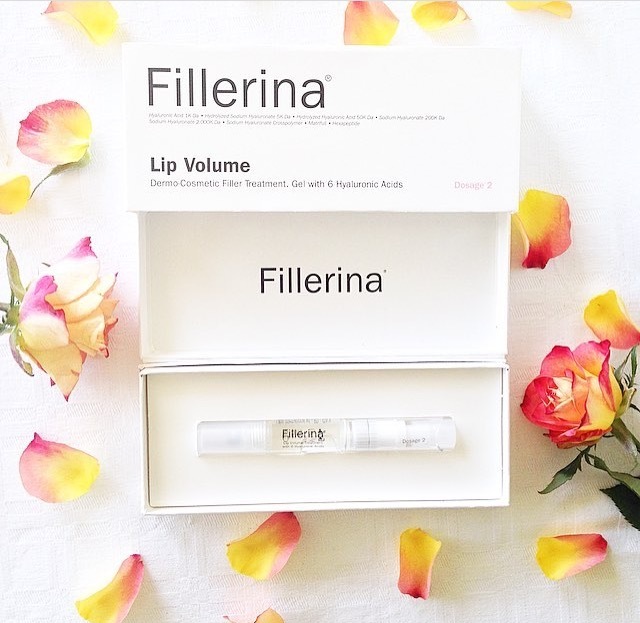 The formulation of Fillerina is absolutely genius; Labo (the luxe dermo-cosmetic manufacturer of Fillerina) have used 6 different densities and cross-linked forms of Hyaluronic acid (sodium hyaluronate is the form in many high end anti ageing creams/cosmeceuticals) meaning you are getting the best, most intensive hyaluronic acid treatment available on the market. I couldn't think if a better formulation for a lip plumper for boosting volume and for smooth, soft lips- and would recommend to all. Thank you so much Fillerina for another stand out cosmeceutical product. Hello lovely readers! 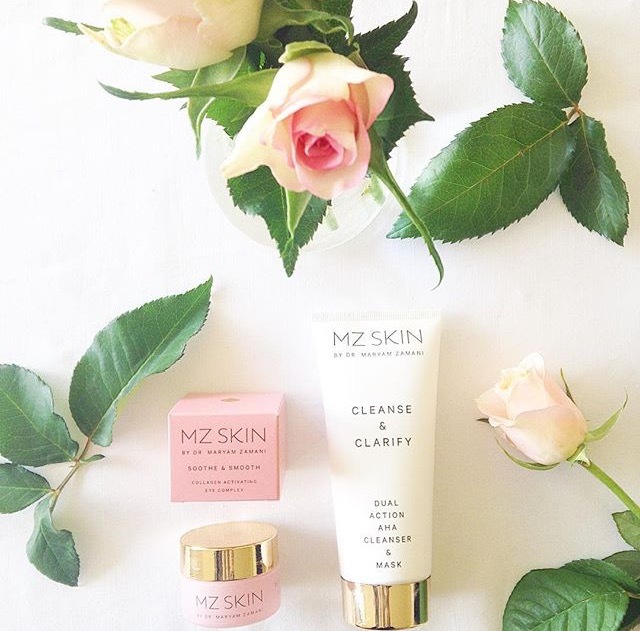 I was so lucky to get to try the incredible MZ range created by Dr Maryam Zamani a renowned consultant Oculoplastic surgeon and aesthetic doctor. I absolutely love the products I tried and even have "empties" which is rare for a blogger! The range consists of expertly devised cosmeceutical grade products with the most beautiful branding and luxe feel. I really feel Dr Maryam has got this right- and every time I use these products I can see very immediate results in glowing, bright skin. A stunning range that really works. 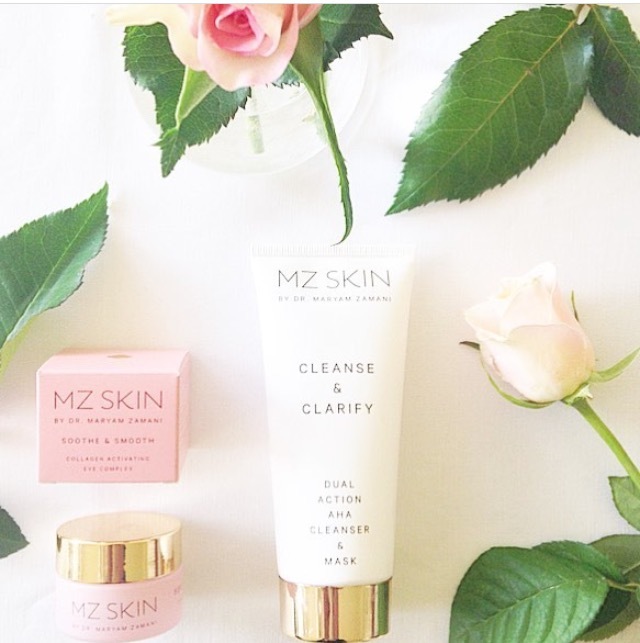 The Cleanse and Clarify Dual action cleanser and mask is gorgeous- it has a rich luxe texture and uplifting peppermint scent. My skin feels so soft and refreshed afterwards. I have very sensitive skin that tends towards Rosacea and I have had no irritation at all making this the perfect go to daily skin boost. I love that left on for longer, it works as a mask- because our skin is dynamic, and its lovely to alternate between a quick cleanse and longer treatment. 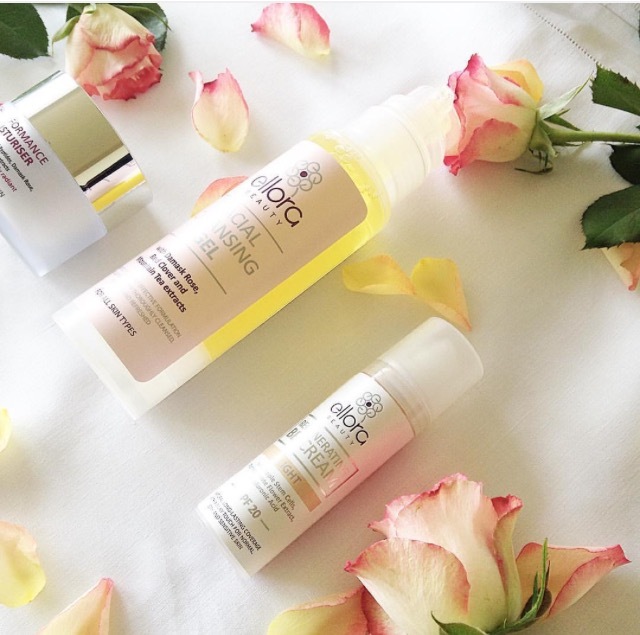 Alpha hydroxy acids (AHAs) are naturally occuring acids such as glycolic acid or lactic acid which work by decreasing hyperkeratinisation (common to many skin disorders) and the cohesion between corneocytes. This essentially loosens the bonds that hold dry, dead skin cells on the surface, which gives rise to newer cell production belowwhile also boosting hyaluronic acid production. AHAs are therefore fantastic for skin ageing and rejuvenation, as well as for gentle chemical exfoliation, removing debris and pore clogging factors. It has been repeatedly shown that AHAs can increase collagen and Hyaluronic acid production- key factors in maintaining youthful skin. I have been using AHAs for a long time now, and I love how this formulation is so gentle and pampering as I have always struggled with cleansers irritating my skin. I have been told how glowing my skin is and this the cleanser is definitely boosting my skins radiance. While ofcourse, as a beauty ingredient geek the addition of Albizia Bark extract was of particular interest to me and I love how Dr Maryam has added this- a perfect cosmeceutical formulation with amazing botanical additions. In Traditional Chinese Medicine (TCM) Albizia has several phytonutrients which are thought to help strengthen capillaries, boost circulation and reduce swelling. In terms of biochemistry a certain methanolic extract of Albizia bark demonstrated significant free radical neutralising potential. The compound jubriloside saponin from the bark demonstrates significant anti-tumour activity and functions as an anti-glycation molecule. As glycation is key to skin ageing and interfering with the collagen matrix this is a truely wonderful addition. Another fantastic addition is also the addition of Caryodendron Orinocense Nut Oil (Cacay oil) I was told about this oil a while ago, and I think this is a genius addition it is high in nourishing Linoleic acid and is higher than Argan oil in terms of vitamin E and vitamin A (Retinol Palmitate) content. The perfect duo and I would highly recommend the MZ range to all. Thank you so much ebwpr for these beautiful products! I would love to know, have you tried any products from MZ skin? 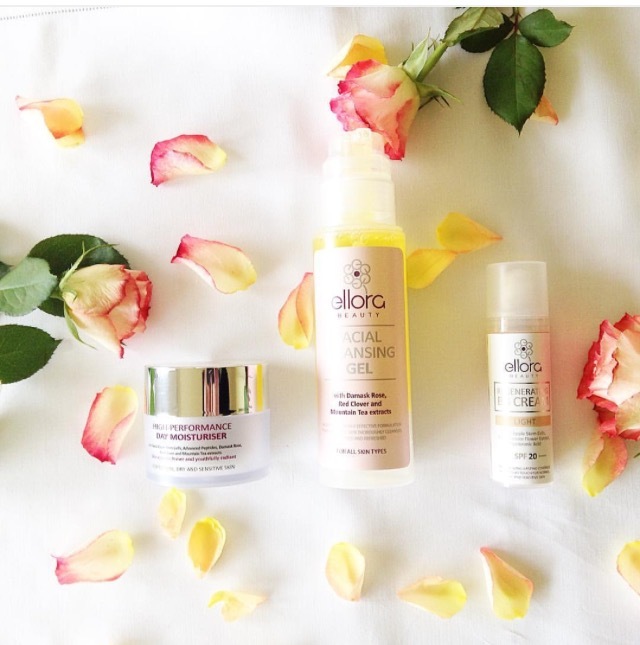 These products have some incredibly innovative and unique ingredients which have left my skin soft, glowing and fresh. The facial cleansing gel is absolutely beautiful- ideal for refreshing tired, dull skin. It has a beautiful botanical based formulation with Damask rose (an Ayurvedic staple for beauty) and red clover extract, which maintains the slightly acidic pH of the skin while some harsh cleansers can cause the hallmark stinging and sensitivity. This is without a doubt one of the most gentle, refreshing cleansers I have used so far and would recommend to anyone who struggles with finding a delicate yet effective cleanser. The gel texture is a joy to use, it doesn't excessively strip the skin of oils but still cleans deeply, foams and has a gorgeous fruit scent. The moisturiser is thoroughly nourishing and suitable for all skin and age types (I am 26, and I gave some to my father, 65, to try as a guinea pig) Moisturisers work to minimise trans-epidermal water loss. This is important to maintain, especially in summer or when swimming a lot in chlorinated or salt water pools. I wrote an article the other day about the difference between moisturisers, serums and oils, and it occurred to me that I hadn't done a blog post on this! Our skin is constantly losing water through evaporation and moisturisers essentially form a water-repelling layer (usually through the use of a fat or oil base) which helps conserve the intrinsic moisture levels of the skin. There are the same beautiful botanical extracts as the cleanser (I love it when brands have this continuity in their formulations because it means if you like one product you're likely to like the others in the range as a set) In addition, there are some incredibly innovative, stand out ingredients. The moisturiser has the addition of PhytoCellTec™ a patented apple stem cell complex. Topical use of this complex has showed a significant reduction in the appearance of wrinkles when applied over 4 weeks in one study. I've featured plant stem cells before and I think they will be a big addition in future cosmetics and would love to see more clinical trials in the future. Another perfect addition is Matrixyl® 3000, an updated peptide complex from the original Matrixyl complex. A patented complex, it is a combination of the most effective peptides which have several clinically documented anti ageing benefits on the skin. The mechanism is incredibly interesting, and its all due to the nature in which cells tend to respond to the environment or the presence of molecules in cell signalling pathways. Matrixyl 3000 mimics the appearance of broken down collagen (although there is no broken down collagen) which in turn, causes the skin to respond by initiating further collagen synthesis, which could be highly regenerative. At the right concentration, this complex can even double collagen production shown by researchers, leading researchers to even consider this complex for medical applications such as advancing wound repair. I absolutely adore this moisturiser because it has as many benefits as a hard working serum as appose to solely minimising water loss. The BB cream gives the most instant dewy glow, people kept on remarking how well I looked when wearing this, and I love how light it feels and how it delivers multiple benefits to work to improve your skin while providing coverage with a redness neutralising tint (I am prone to rosacea and this neutralises it perfectly). The addition of SPF 20 to prevent premature skin ageing, and hyaluronic acid makes an ideal summer BB cream. Hyaluronic acid enhances the skin's ability to retain water, stay plump and supported and maintain the skin volume which is vital to youthful, gorgeous skin. 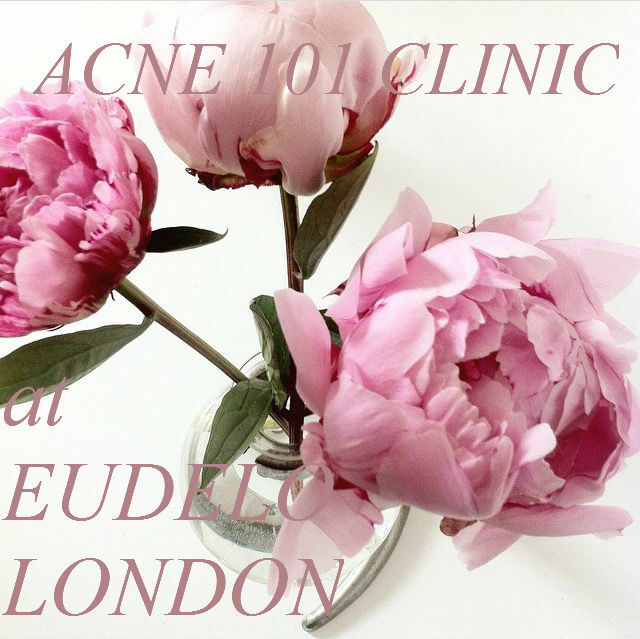 I was lucky enough to attend the most amazing Acne 101 event at The Eudelo Clinic hosted by leading Dermatologist Dr Stefanie Williams and Em from mypaleskinblog. The event was all about Acne, and Dr Stephanie provided some absolutely incredible treatments, as well as a talk on Acne, and consultations for bloggers. 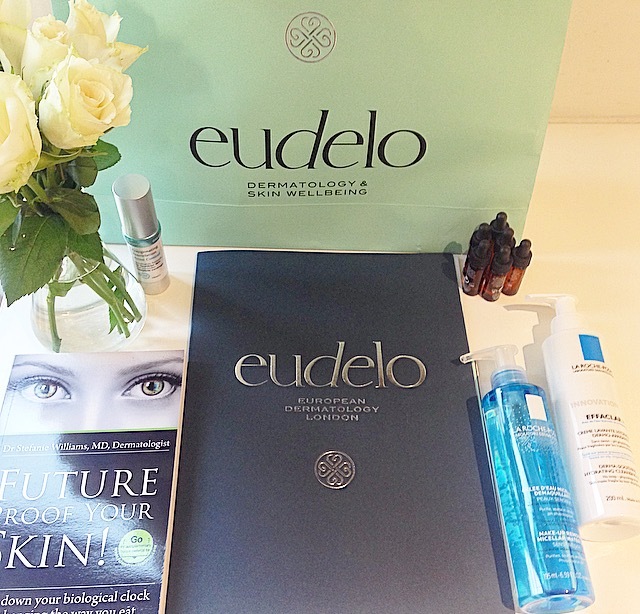 I was lucky enough to sample the Hydrafacial, recieve a bespoke skincare consultation (with a menu for tailored skincare recommendations and gorgeous goody bag of my tailored products to try) The clinic is incredible and I felt so well looked after. Dr Stefanie's expertise is so thorough and I would recommend a consult with Dr Stepfanie and her team of lovely Medical Aestheticians to everyone wishing to improve their skin. I even learnt that I had a tendency towards rosacea, and should therefore use skin calming and non-aggressive ingredients. The Hydrafacial was the best facial I have ever, ever received! I was told I was glowing after from my friends, and my skin felt so soft. Hydrafacial utilises the best aesthetic techniques, and uses advanced methods of cleansing and exfoliating and extraction of congested skin areas using salicylic acid, as well as an amazing delivery of hyaluronic acid, antioxidants and peptides to hydrate and plump the skin. This would be the ideal all encompassing facial to have on a regular basis. THE SCIENCE BEHIND THE BEAUTY: WHAT IS ACNE? Acne is a complex condition, with multiple etiologies and perpetuating and worsening factors ranging from genetics, diet, rising androgen levels and other hormonal imbalances as seen in PCOS, overgrowth of pathogenic bacteria and cosmetic use. In normal skin, sebaceous glands lie under the skin which produce sebum, an oil which protects the skin from moisture loss. As we enter teenage years, sebum levels may be increased, and in some situations, this can lead to pores becoming blocked which can combine with dead skin cells on the surface layer of the skin. This can also encourage the growth of Propionibacterium acnes. While it is normal to have a certain amount of this bacteria present in the skin, an overgrowth in clogged pores can cause infection which stimulates the immune system into an inflammatory response causing some of the hallmarks of an inflammatory response- red, painful and swollen and production of fluid in the affected areas. Dr Stefanie explained how because there can be multiple causes, many people suffer from acne alone, long term and it can negatively affect self esteem and even day to day happiness and quality of life often causing depression, anxiety and even agoraphobia. This really saddened me that many people are affected by acne in this way and I think this is why one of the reasons why it is so important to seek professional treatment- as there are some very effective treatments now available. Effective treatment of acne is thorough and holistic. Common approaches include antibiotic use, retinoid application, medical grade facials and structured cosmeceutical use of hydroxyacids and oil free moisturisers and other methods which an experienced Dermatologist can advise on. I learnt about the importance of a Treatment and Maintenance cycle or plan, which is important to follow even if the symptoms improve. Perpetuating factors such as Nutrition are so interesting to me as a training Clinical Nutritionist, and studies have also found there is a potential for dietary interventions such as a low GI diet and dairy free diet which may help improve acne symptoms due to the interplay between Insulin and acne. I know at least anecdotally that these two factors have helped me achieve clear skin with very rare break outs. I absolutely loved this event and learnt so much. Thank you so much Dr Stefanie and your lovely team. I was so lucky to be invited to an amazing event at the Debbie Thomas Clinic in Chelsea with Esthechoc for a chocolate and wine night (!) from the gorgeous Molly from Ebwpr. I learnt about the science behind this innovation- a daily chocolate that is a Nutraceutical and is beneficial for health and your skin- I love science. Esthechoc is vegan, and absolutely delicious- in fact, it tastes better than even the nicest dark chocolate I've eaten. After ten years of research in development by The Cambridge Chocolate Technology (A research group I would very much like to work in) Esthechoc was made. 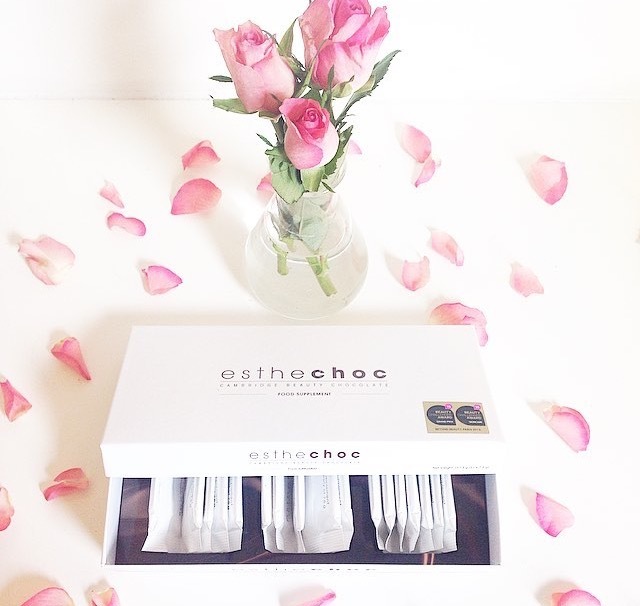 Esthechoc works as an anti-ageing Nutraceutical by providing a high concentration of both antioxidants and anti-inflammatory compounds; Astaxanthin and polyphenolic epicatechins. 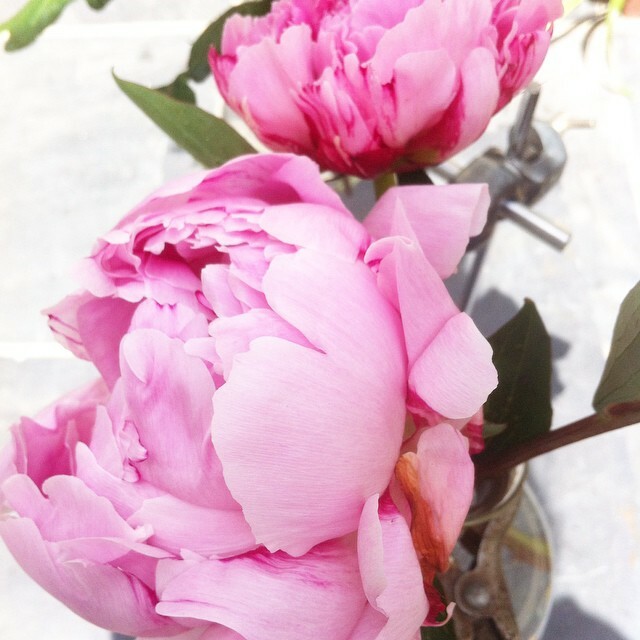 This is so beautifully devised, that researchers have not only aimed at the antioxidant basis of an anti-ageing product, but also incorporated in my opinion, one of the most powerful anti-inflammatory ingredients. As inflammation is is also a contributor to many skin disorders aetiologies this is interesting, as it means Esthechoc could be beneficial to many conditions. Polyphenolic epicathechins are the fantastic antioxidants to incorporate into the diet. They have among the highest ORAC values and are found in cocao and green tea and work by neutralising free radicals. Free radicals are irreversibly deleterious to the collagen matrix via cross linking and generation of AGES (Advance Glycation End products)which is why topical antioxidant complexes and a rich source of antioxidants in the diet can be some of the best ways to protect the skin. Astaxanthin is a powerful anti-inflammatory and antioxidant, which has shown, when applied topically, to stimulate increased fibroblast activity which in turn boosts collagen and elastin formation. The research is so incredibly impressive from Esthechoc, and what I love is the skin bio marker results; its often hard to see real, skin marker results in real individuals and the results show how the Esthechoc supplement in as little as 7.5 grams per day can offer benefits in just 4 weeks. The skin biomarker results were substantial; With ageing skin, there is often diminished or compromised circulation. Esthechoc showed a substantial improvement of oxygen concentration in both blood plasma and in tissues, showing potentially a beneficial systemic effect. In terms of Dermatology, an improved circulation provides the skin with nutrients and oxygen for healthy skin cell metabolism,which in turn improves complexion appearance and assists repair processes. Specifically, Esthechoc was shown to increase oxygen saturation of tissue by 59% and improve oxygen transport in the plasma by 85%. These are truely incredible results, and show the success of ten years of research and innovation. In addition, Esthechoc also reduces oxidative damage in inflammatory conditions upto a significant 72%. 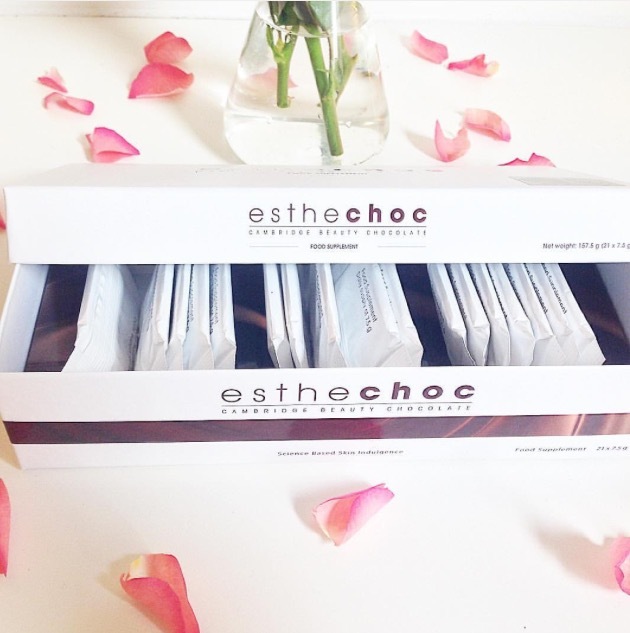 These factors all improve the metabolic condition of the skin, and the hallmarks of ageing; often due to inflammation and decreased metabolism, may be improved with Esthechoc. An amazing innovation, and shows the future of nutraceuticals- making delicious supplements with aesthetic and health benefits and robust clinical development and trials behind them. A must have for any beauty routine in the New year.